Markets are on edge after a broad decline last week, and analysts expect a global trade slowdown. Russian Energy Minister Alexander Novak said on Saturday there was no reason for Russia to freeze or cut its oil production levels. Fund managers cut bullish crude holdings to 15-month low. 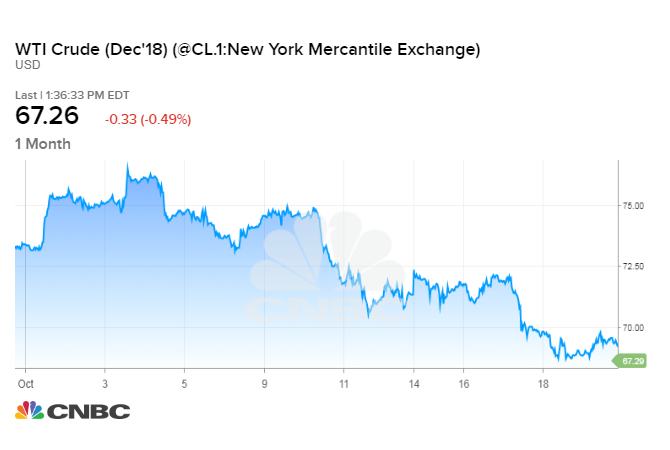 Oil prices fell on Monday as as Russia signaled its output will remain high and concern over the global economy put crude on track for its biggest monthly fall since mid-2016. Losses were limited ahead of U.S. sanctions on Iranian exports that are expected to reduce supplies when they come into effect in just under a week. U.S. crude futures ended Monday's session down 55 cents to $67.04. The contract has slumped about 8.5 percent in October, on pace for its largest monthly percentage decline since July 2016. Brent crude oil futures were down 8 cents at $77.54 a barrel at 1:38 p.m. ET, dropping about 6.3 percent this month and also threatening to post the worst decline since July 2016. The OPEC, led by Saudi Arabia and non-OPEC member Russia, agreed in June to lift oil supplies, but OPEC then signaled last week that it may have to reimpose output cuts as global inventories rise. Industrial commodities such as crude and copper have been rattled by hefty losses in global equities due to concern over corporate earnings, and fears over the impact to economic growth from escalating trade tensions. Though equity markets recovered on Monday, the benchmark S&P 500 was on track to post its worst monthly performance since May 2010. The U.S. dollar index also rose, supported by robust U.S. consumer spending data. A stronger dollar makes greenback-denominated commodities more expensive for holders of other currencies. "It is often said that when stock markets sneeze, commodities catch a cold. This adage was on full display last week as a global rout on equity gauges dragged the energy complex lower," PVM Oil Associates strategist Stephen Brennock said. With just days to go before U.S. sanctions on Iran take effect, three of Iran's top five customers — India, China, and Turkey — are resisting Washington's call to end oil purchases outright, arguing there are not sufficient supplies worldwide to replace them, according to sources familiar with the matter. — CNBC's Tom DiChristopher and Gina Francolla contributed to this report.